As outdoor rooms and living spaces rise in popularity, so do cooking spaces—especially outdoor kitchens. Grilling and dining outdoors are the most common reasons for spending time in one's yard or space. Outdoor kitchen equipment can be added in modular units, starting with a grill, then adding appliances and features like counters and islands as your needs and interests grow. So, is it time to add more than just a tiny charcoal barbecue? Consider these valid reasons for building or buying an outdoor kitchen. It's a known fact that hamburgers and hot dogs taste better when they are grilled. The same goes for steaks, chicken, seafood, vegetables, and pretty much everything else. If you have a decent grill and learn how to use it properly, it won't be long before you start eyeing opportunities to use the grill, even for seemingly mundane dinner fare. During the summer, you might find yourself out there every evening at the grill. Hey—enjoy it! Cold temperatures and snow won't keep you from grilling that slab of meat or your favorite appetizers before the game. Everything tastes better on the grill, any time of the year. Just try a Thanksgiving or Christmas turkey on the grill: it cooks quickly and is juicy. You'll never look back. There you are, dicing onions and garlic, stirring up a sauce in the kitchen, then running out to the grill to slap it on to the chicken. Back and forth. Wouldn't it be so much nicer if you had prep space to cut vegetables and herbs, then just pivot around to the cooktop, much like indoors? Maybe it's time to add some counters or an outdoor island. Look at you, living in a place where the sun shines most of the time. And there you are, holed up in that indoor kitchen like a hibernating animal. Get yourself outside and start cooking. First, for yourself, then family or neighbors and friends. It's one of the perks of living in a warm-weather region. Take advantage of it and really enjoy it! A yard is a luxury that is meant to be enjoyed. Urban dwellers would kill for your plot of land. Rather than simply looking out the window now and then, actually step your foot outside and enjoy that real estate in the yard or on the patio. Start with a barbecue or grill, then add pieces as needed. It doesn't take long to get very accustomed to cooking outdoors. Some actually prefer it. Think about it. Everyone eats, but not everyone swims. Doesn't building an outdoor kitchen make more sense than building an in-ground swimming pool? You can use it more months of the year, it doesn't require as much maintenance, and you don't (and shouldn't) have to wear a swimsuit. 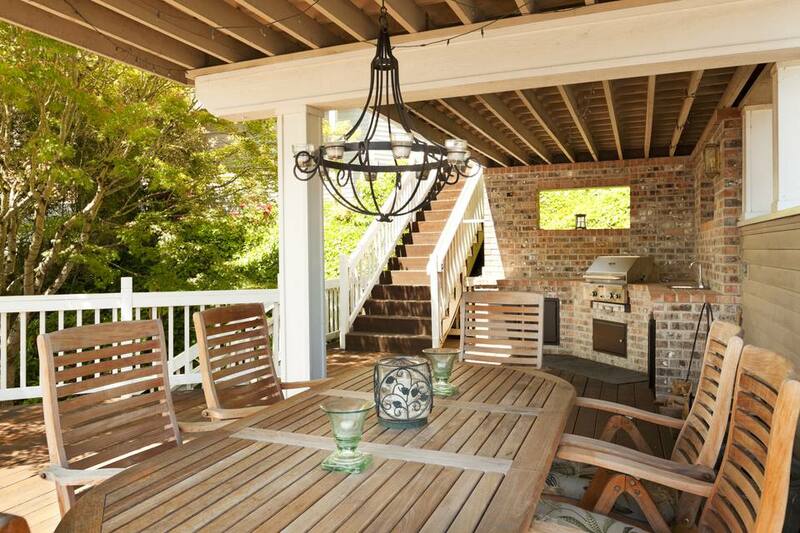 When it comes time to sell your house, an outdoor kitchen is a real amenity. The idea of eating outdoors appeals to just about everyone.